Make and bake cake mix as directed on box, using water, oil and eggs. Cool completely in pan on cooling rack. Crumble cake with fork. In each of 24 (4-oz) glass jars or cups, place 1 small scoop of ice cream. Layer with crumbled cake and half of the cookie pieces. Top with remaining ice cream, a dollop of whipped topping and remaining cookie pieces. Serve immediately or freeze until serving time. 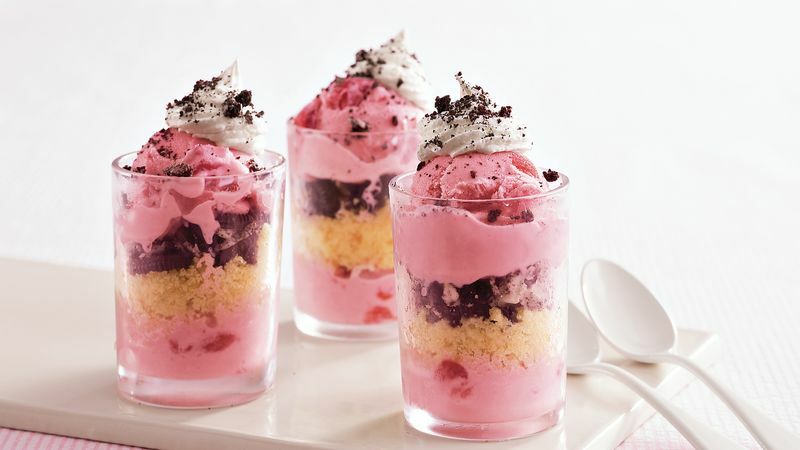 Replace strawberry ice cream with your favorite flavor, and replace the yellow cake with chocolate or another flavor. Make these shooters up to 4 hours ahead of time; just keep them covered in the freezer until you’re ready to serve. Small mason jars or jelly jars work great for these shooters. For a special touch, place them in colorful paper baking cups when serving.